If you know me, you know that I am a fan of unique, custom, personalized artwork. I love things that make you stop and think and I love things that are personal but still look great! As an interior designer, it's sometimes hard to find things that will work within a clients (or my own home) that fits these categories in a sleek way, without being cheesy!! That's where Modern Map Art comes in! One of my favorite decorating themes, as you'll know if you've ever come to my home, is maps!! Vintage maps, new maps, maps of places you've been or want to go. There is nothing more visually appealing and worthy of a story than a beautiful map. I've actually been eyeing those gorgeous custom made star maps for quite some time so when Jennifer with Modern Map Art approached me I was SO excited! Let me explain what it is and how it works! The Custom Night Sky Star Map lets you input any date and location and will show you an actual visual of the night sky on that date and time and above the location you have selected! This is one of the sweetest, most sentimental gifts I think you could ever give. Perfect for an anniversary gift showing you where you first met, the night sky over your wedding day, or when a child was born! You can customize the font, background and map colors and whether you want constellations on your map as well. The sizes vary from 8x10 all the way up to 24x36 so you can have a smaller piece that sits on a side table or gallery wall or a large statement piece that hangs above your bed! 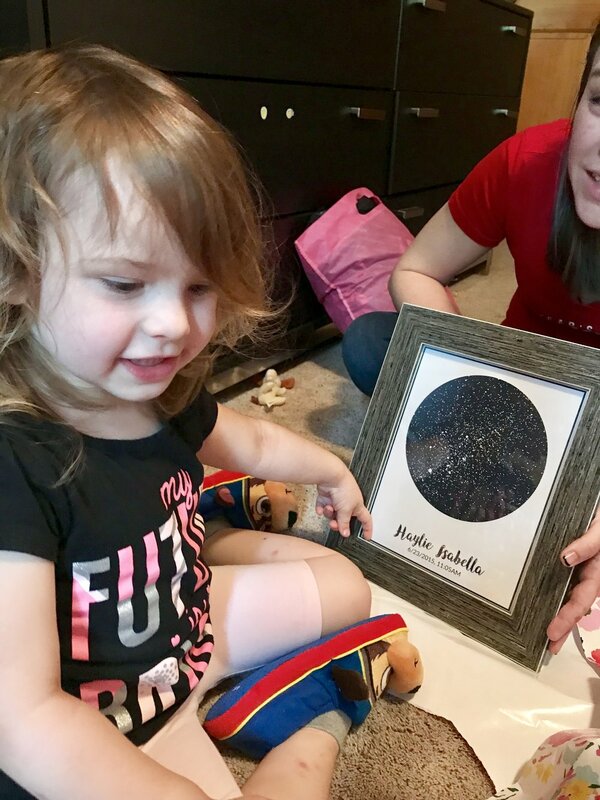 Coincidentally enough, my sweet god-daughters birthday was coming up and I just knew I wanted a star map showing the sky above her when she was born! I know it's something she won't really get or understand until later but it makes a perfect decor piece for her room now and when she's older I hope she'll think it (and me) are cool!! I chose the date and time she was born as well as the location and typed in the coordinates and voila! Before my eyes the night sky above Wilmington, North Carolina came into view and all I had to do was type in the size and type of print I wanted, the colors I like and the type of font and text I wanted to add! I purchased a rustic wood frame from Amazon that perfectly complimented the deep navy blue on the map print and it looked absolutely perfect! If you want your very own beautiful custom star map, go to this custom link RIGHT HERE and order your very own for yourself, a loved one or someone in need of some cool new art! I think Haylie loved hers!! !